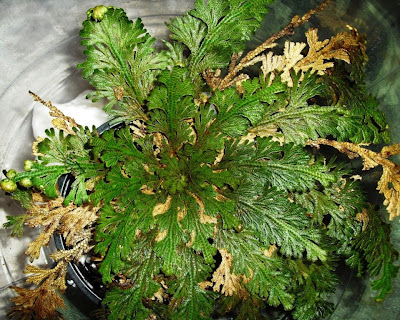 Selaginella lepidophylla, aka Resurrection Plant, partially unfurled, about 4 hours after being immersed in water. 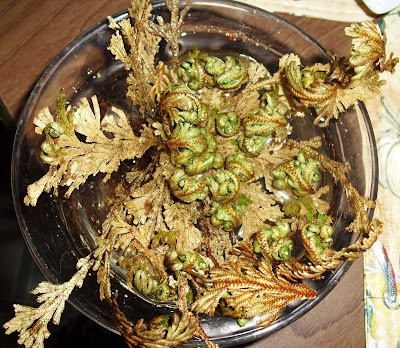 Resurrection plant, the day after the complete unfurling. Unfortunately, I don't have a picture of it at its maximum rehydrated state. Though I put its roots in a pot of moist soil after removing it from the water, it had already started to dry up bit in less than 12 hours in the open air. 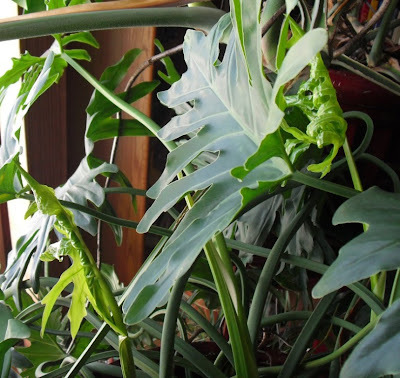 Notice the curled leaves on the far left of the picture. I've since placed it in a makeshift terrarium, so that it is surrounded by moist air. We'll see how that goes. In other goings on, Chia Kitty continues to put on "fur," albeit unevenly. ...less so on the other, and still bald on top. Now I'm off to take some leaves internally, in the form of a nice hot cup of tea. People talk about colds like they're trivial, mere inconveniences, but in reality they can really mess a person up. Sorry you've been unwell. Thanks Mr_S. When I was a little kid, I generally had to go to school when I had a cold unless I was extremely sick, because in my working household, no one could afford to stay home with me too often. When I got to high school age, and could stay home alone, I was amazed at how often my mother let me stay home in bed with a cold. I had come to think that a cold was something to be treated, like you say, as a mere inconvenience. I still have trouble shaking the idea that I'm being overly self-indulgent when I spend most of the day taking it easy, no matter how lousy I feel.